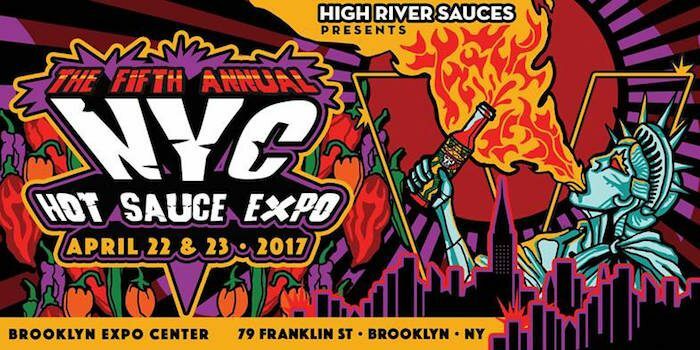 We’re at the NYC Hot Sauce Expo 2017 this weekend. Stay tuned for our video reports from the show. New York’s own High River Sauces proudly presents the 5th Annual New York City Hot Sauce Expo on April 22nd & 23rd 2017. The NYC Expo will feature up to 45 artisanal hot sauce makers from all over the United States and as far as Australia, Canada, England, New Zealand and South America. The NYC Hot Sauce Expo has grown into an International Hot Sauce celebration. Witness the action packed event with hot sauce tastings, eating challenges, spicy food vendors, craft beer, spicy cocktails and plenty of odd ball entertainment for the whole family.